Kathmandu has been a Himalayan haven for travellers for decades. The city moves with human life and is famed for its chaotic hustle and bustle. The existence of Pashupatinath crematoria is a reminder that all life eventually comes to an end. Pashupatinath temple is a huge structure that looms over the banks of the Bagmati river, which ultimately joins the holy river Ganges. Hindu cremation ceremonies take place here on an industrial scale. Visitors are invited to observe the rituals which might seem a little strange, but to Hindus death is an important part of the journey of life. Daily life in Kathmandu is fast-paced. It’s Nepal’s capital city so this is to be expected, but the pace of life here is conducive to things going wrong from time to time. Kathmandu’s hospitals are often filled with serious injury cases that come in as a result of road traffic accidents and the like. The staff do their best for these patients, but it’s not always possible to prevent the worst. As a healthcare enthusiast you’ll be fascinated to see what happens to those the hospitals can’t help. Observing a cremation will also give you a real insight into the complex religious beliefs of the people you might end up working with. There are many religions in Nepal. The most widely practiced is Hinduism which we’ll revisit shortly. After Hinduism there’s Kirant Mundhum, a type of shamanism practiced by the Kirat people. The religion is based around ancestor worship and a reverence of mother nature. After that comes Islam, then Buddhism. The remaining religions like Christianity haven’t been as widely adopted. Hinduism, being the country’s main faith, is pervasive. Ideas like karmic balance and reincarnation lie at the heart of the belief system and are obvious in many aspects of Nepalese culture. It can be seen especially clearly at Pashupatinath. The temple and the ground it’s built on are so sacred that only Hindus may enter. This applies to travellers too, so you’ll be respectfully asked to watch the proceedings from the bank on the opposite side of the Bagmati river. Pashupatinath temple honours the Hindu Lord, Shiva. Shiva is the god of transformation or destruction (which is pretty appropriate considering the temple’s main function), and conforms to the Hindus’ belief in karma and reincarnation. In the company of the resident monkeys you’ll catch the brightly dressed holy men or ‘sadhu’ happily posing for pictures in exchange for a few coins. The sadhu depend on ‘gifts’ to survive, but some locals seem to frown upon what they consider to be begging. 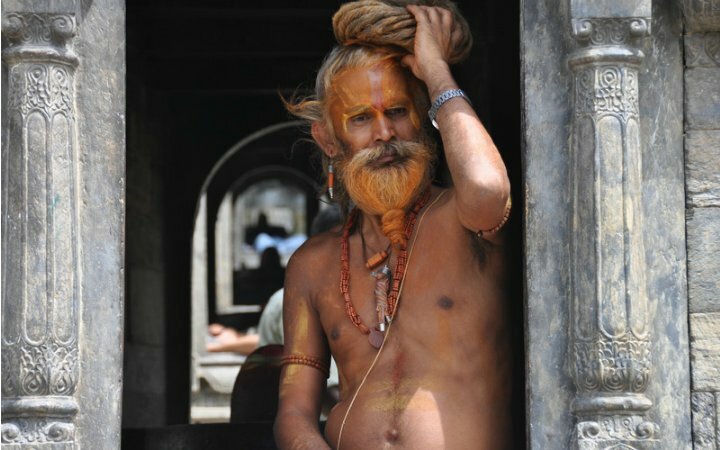 However, the sadhu are extremely photogenic, so take some snaps if you think it’s appropriate. The ceremony itself has to be seen to be understood, but the following should shed some light on the process. The coffin, or sometimes a stretcher, is carried by an all-male troupe to the temple and the body removed. The deceased is then covered in pure-white cloths leaving only the head uncovered. The family take the body to the temple for its final visit and then respectfully undress it. After throwing the clothes into the river the body is bound with more white cloths, again leaving the head exposed. The men take-up the stretcher and walk three times, in a clockwise direction, around the wooden funeral pyre before placing the body on top. The family’s oldest son then walks around the pyre before lighting the kindling near the head of the deceased. This is significant as Hindu’s believe the person’s spirit is freed through the mouth. The moment the pyre ignites into flames the body is covered with a mass of wet straw which produces a cloak of white smoke. The smoke shields the body from view as the cremation process takes place. The family then wait a number of hours until the body has been completely cremated. Finally, the remains are scattered into the river. There’s something uniquely peaceful about the place despite the morbid overtones. Perhaps it’s something to do with the way the Hindu’s view death as rebirth and not the ‘end’. But whatever your beliefs, a trip to Pashupatinath helps to dissolve cultural barriers by presenting to us the one truth that we all must inevitably experience. 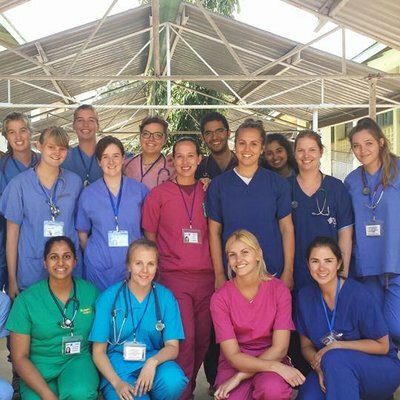 Read more about our elective programme in Kathmandu here.